To celebrate the arrival of our two new Shepherds’ Huts we are offering two nights glamping in our five bell tents or any of our wagons and shepherds huts or £100! You can view the dates available for your desired accommodation (tents, Bell Tents or Romany Wagon) on our bookings calendar. Scroll over the dates you want to view availability. Unavailable dates are shown in red. If you wish to book for a maximum of 3 tents click on your desired arrival date to go through to our online booking system. To complete your booking we ask for a deposit of 50% at time of booking. This is paid online via our secure payment partner, Worldpay. If you want to book for a larger group, if your group has variable nights or if you have any questions just email us clicking the ‘get in touch’ link at the bottom of this page. Alternatively, telephone us on 07901 368417. If we are unable to accommodate your requirements please contact us directly as we can sometimes move things around to fit you in. Please note: You will need to pay your deposit at the end of the booking process. Please ensure you have a valid credit or debit card to hand before proceeding. Minimum 2 nights stay applies. Occupancy based on 2 adults + 3 children per tent. £7.50 supplement per adult per night and £5 supplement per child per night applies for numbers over. Max occupancy 2 adults + 3 children per bell tent. Max occupancy 2 adults + 1 small child. Max occupancy 2 adults + 2 small children. Max occupancy 2 adults + 3 children. 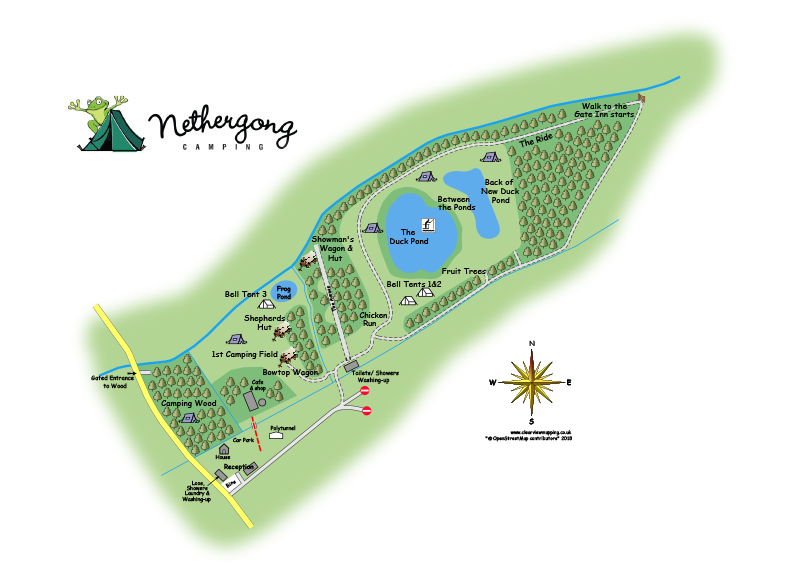 Our campsite is set in 26 acres of beautiful woodland and meadows. If you have not visited us before we normally show you around the site and there are usually several choices of areas available for you. We do not have marked pitches. If you have visited us before and have a preferred camping area please enter details in the text box below. We will try our best to accommodate you although at peak times this may not be possible. If you want to be pitched with an existing booking please add surname of booking or booking reference number here. If you have to cancel your booking outside our refund period (30 days before arrival), we will, of course refund you for any logs and firepits you have pre-ordered. Logs and firepits will be delivered to your pitch before you arrive (if pitch has been pre- assigned) or shortly after if not. Additional logs can be ordered on arrival/while with us. Will you be erecting a gazebo? As we have found that gazebos are taking up additional pitches we regrettably are making a charge of £5 per gazebo. Please tell us a bit about yourself. You will be the main contact for the booking party. Please note: Your booking will not be valid unless a deposit is paid.